Rose Paperie is a small book bindery just outside Boston, Massachusetts creating hand bound books for sketching, writing and preserving photographs. Since architecture school, Katelyn Mayfield has been experimenting with book arts as an outlet for hands-on making, a welcome change from the digital world. Her interest in bookbinding began as a way to compile sketches and ideas gathered through projects and travels abroad. Soon, she was perfecting the non-adhesive coptic stitch and the long-stitch binding method; using the coptic for sketchbooks since it can lay flat when opened and using the long-stitch for photo albums for viewing photographs. 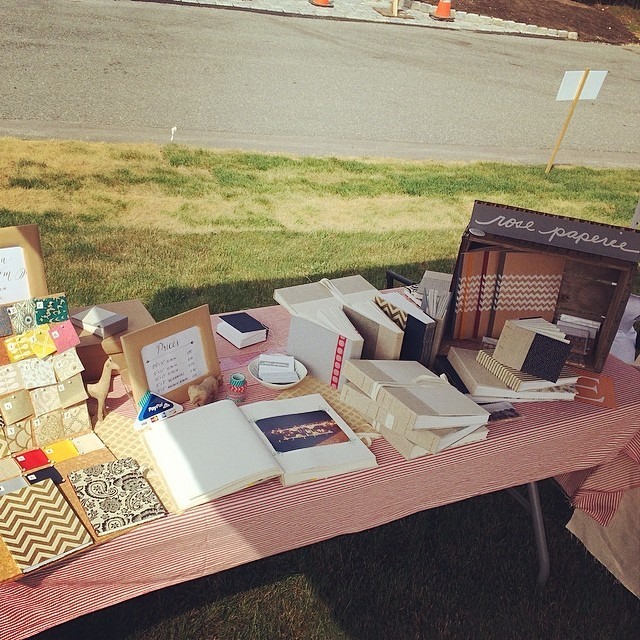 As more and more friends and family requested custom sketchbooks and wedding albums, Rose Paperie was born. Katelyn's passion and enthusiasm for this centuries-old art has grown through designing spaces by day and refining bookbinding techniques by night. All books are hand measured, folded, cut, glued and sewn by Katelyn in her studio. This process not only ensures every book's uniqueness, but also fine craftsmanship that has been in practice for many years. Current experimentations include accordion books and binding with leather! Every book is custom bound based on your needs. We can match wedding colors to guest books and photo albums, and baby nursery colors to baby books. Just let us know your palette and ideas. We can also discuss special requests, such as storage pockets, photograph preservation sheets, first page protection sheets, calligraphy within the book and monogramming. Lead time for design and construction of these books is approximately 2 to 3 weeks. Wedding Photo Albums - Wedding Guest Books - Baby Books - Sketchbooks - Journals - Accordion Photo Albums - Portfolios - Artist Books < we would love to be your artist book bookbinder! Questions? Comments? Looking for a unique, one-of-a-kind guest book for your wedding? Baby book for your newborn? Sketchbook or journal for your next trip abroad? We can work together to create the book you are envisioning. Just ask! Thank you for your support of handmade books!